Searching for a Ray of Hope After Netanyahu’s WinIntelligencer writers discuss whether Israeli politics need to get worse before they get better. Bibi and the Christian Right Agree: Trump Is the New Cyrus the GreatNetanyahu gives his friend the president the great favor of reinforcing conservative Evangelical belief that Trump’s the supreme virtuous pagan. Immersive Theater Fan Benjamin Netanyahu Keeps Going to Sleep No MoreMaybe he’s just really into hanging out in the candy room. Jared Kushner’s Road Map to NowherePutting his inexperienced son-in-law in charge of Mideast policy was a shocking act of nepotism by Trump. We’re starting to see the consequences. Trump’s Messy, Mostly Successful Israel VisitLet’s concede that the White House achieved all of its short-term objectives. But there are some ominous signs too. Trump Sent Alan Dershowitz to Tell Netanyahu ‘Time Is Ripe’ for Mideast PeaceThe president ran into the celebrity lawyer at Mar-a-Lago. Peace was talked and messages were sent. 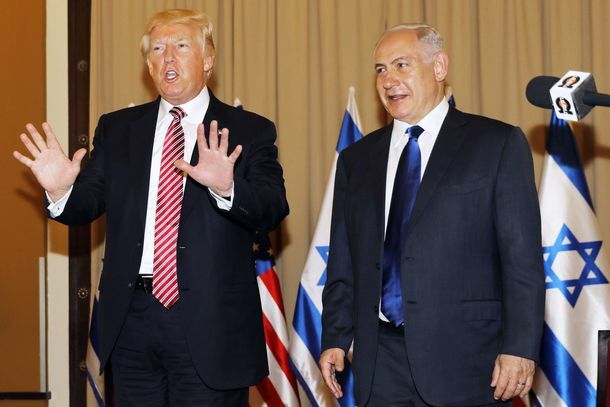 In Meeting With Netanyahu, Trump Says U.S. Won’t Insist On a Palestinian StateBreaking with decades of precedent, Trump suggests America is open to a one-state solution to the Israel-Palestine conflict. Netanyahu Attacks Obama Over U.N. ResolutionHe’s looking forward to working with Trump. Obama and Netanyahu Are Trying to Be Friends AgainThe president and the Israeli prime minister met face-to-face in the White House Monday. Is Obama Being Too Hard on Netanyahu?Some Israelis say U.S. criticism of the prime minister’s preelection remarks has gone far enough. Netanyahu: Don’t Listen to My Explicit PromiseHis promise to block any Palestinian state has been cruelly manipulated by people who understand words. The Coming Transformation of the U.S.-Israel AllianceOne-staters on both sides rejoice. Two-staters rethink. How Netanyahu’s U.S.-Based Digital Gurus Helped Him Pull Out a Surprise VictoryUsing Facebook to target voters and WhatsApp to get them to the polls. Israeli Election Goes From Tie to Netanyahu Triumph OvernightThe exit polls were wrong: The prime minister secured a decisive victory. Scenes From Netanyahu’s Remarkable Election Night Turnaround [Updated]Though the prime minister claimed victory in Israel’s election, the results are hardly a strong mandate. Benjamin Netanyahu’s Wild, Last-Minute Lunge to the Far RightGo right, old man! Netanyahu Clarifies His Chilling Vision for Post-Democratic IsraelThe prospective murderer of the original Zionist dream reveals his plan. Could Netanyahu Actually Lose His Reelection Bid?The prime minister claims there’s “a real danger” that he might be defeated. Netanyahu’s Speech to Congress Has No Plan and Makes No SenseRetelling the story of Purim is not a strategy. What You Missed in Netanyahu’s Speech to Congress — in GIFsSo much clapping. Everyone’s Going to Love the Netanyahu Speech — Inside the Capitol, at LeastLast time the Israeli prime minister spoke to Congress, he received 28 standing ovations in 47 minutes. Obama Takes Preemptive Jab at Netanyahu Ahead of Speech to CongressAs for the GOP, they’re officially too excited. What the Key Players Are Saying About Netanyahu’s Speech to CongressA guide to what political actors think about the latest D.C. event everyone is legally obligated to have opinions on. Kristol: Netanyahu Loves America More Than Obama DoesAmerica’s most confused patriot speaks out.